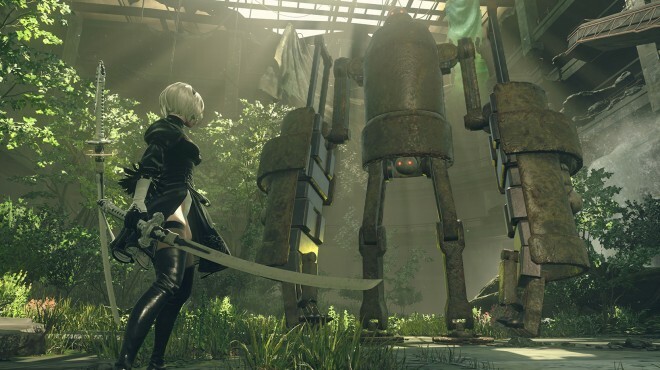 "A Triumph of Gameplay and Storytelling in a Quirky Package"
I haven't played a game like Nier: Automata in a long time. It draws on the strengths and uniqueness of video games as a medium to create an experience that is wholly compelling and unique, even if the individual elements are all things that we've seen before in games. Automata finds itself in good company with games like Spec Ops: The Line, Metal Gear Solid, and Undertale in the way that it plays with player expectations and assumptions about the way video game stories are told. 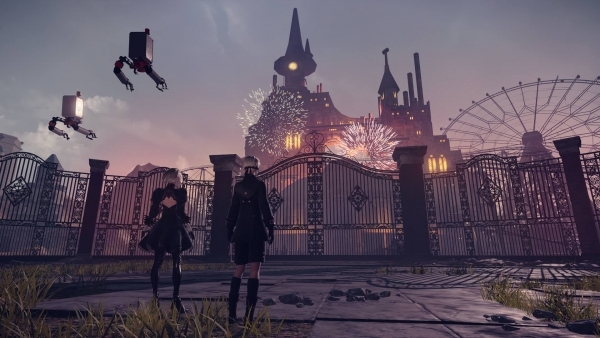 Nier: Automata is a not only a triumph of gameplay and aesthetics, but it's a triumph in gaming that pushes the medium as a whole into new territory. While the game firmly finds itself catering to niche interests, it would be a disservice to not wholeheartedly recommend it to action fans, RPG fans, and any gamer that wants to see the medium played with in new and interesting ways. 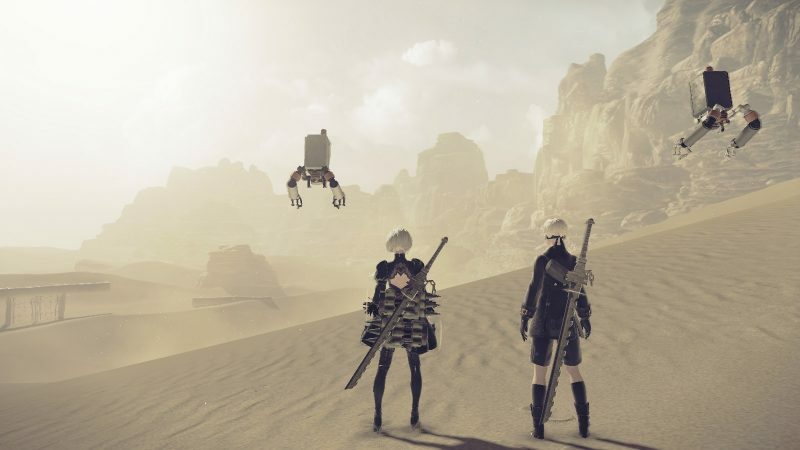 Directed by auteur designer Yoko Taro (who you may have seen in the many wacky promotional videos for the game), Nier: Automata is the sequel to NieR, a 2010 JRPG that was released for the Xbox 360 and PS3 to mixed reception. The original game was praised for its unique storytelling style and creative design. Despite all of that, it was largely ignored due to shoddy visuals, repetitive gameplay, and it's overall impenetrable story. Even fans of the game admit that it's a package that outweighs the sum of its rather mediocre parts. Fortunately, Automata aimed to fix gameplay issues by bringing in PlatinumGames. They are the studio behind such beloved titles as Bayonetta and Metal Gear Rising: Revengeance. Platinum really went above and beyond in creating a game that's an absolute joy to play here. The gameplay is deceptively simple. At face value, Automata is a hack-and-slash action game where you string together combos of light and heavy attacks to battle increasingly ridiculous and complex enemies. Added into the mix are "pods" - hovering guns that you can use to shoot while using your primary weapons. There's a wide variety of weapons to use, ranging from small and quick swords to spears, gauntlets, and more. The pods add additional variety that add in elements strategy helping shake up combat when things get stale. Also keeping the combat from getting stale is the way that the game switches up its own genre. It bounces back and forth effortlessly between a hack-and-slash action game, a platformer, a shoot-em-up, a twin-stick shooter, and more. It even throws in elements of text adventures for good measure. Excellent camera work and enemy encounter design help to make the game feel fresh even if the combat isn't that complex. The game world itself isn't the largest one, but it's packed from end to end with things to do. One downside to this is that there's a great deal of backtracking. Even without going for all of the endings, the game sends you back and forth through areas you've been through before to complete tasks. Fortunately, there is enough to do that the game never really feels as repetitive as it can sometimes be. Upgrading your characters, customizing equipment, fulfilling sidequests, riding animals, fishing, and more round out the amount of time you'll spend in combat against the legions of enemies the game throws at you. Automata paints a bleak portrait of the future in which humans have been driving off their home planet and onto the moon. From there, mankind sends android soldiers down to Earth to combat the machines that drove them off and slowly retake the planet. 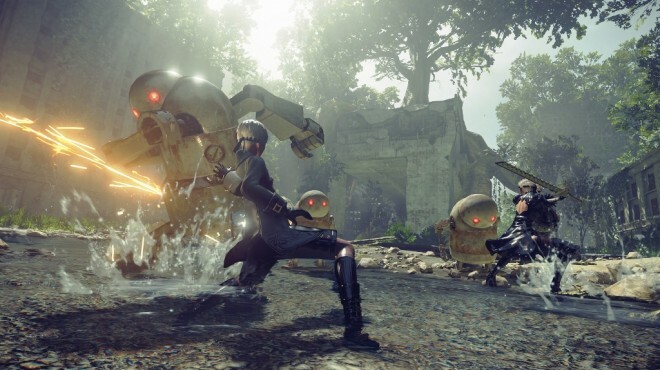 As the android soldier 2B, you will use the variety of weapons and pods in the game to combat the machine menace and slowly uncover the real story of the game. It's a weaving conspiracy that stretches across thousands of years of history and twists and turns in unexpected ways. Much like its predecessor, Automata's plot is dense and oftentimes confusing. Underneath the surface draws out a narrative that ranges from thrilling to heartbreaking and back again. The highs of the story more than outweigh the awkward dialogue and sometimes cringe-worthy fanservice the game tends to drop at random times. One problem that crops up now and again is inconsistent writing. In a game as big as this, it's forgivable. However that doesn't stop the occasional bad bits of writing or confusing dialogue from sticking out. The real draw for Automata though is the way it plays with itself as an interactive medium - it's absolutely nuts. Beating the game once isn't even scratching the surface. The game has a total of more than twenty different endings. Only five of them are mandatory to get the complete picture of the story. Replaying the game doesn't just increase the difficulty or throw in extra quests. It changes the game in fundamental ways that I don't want to risk spoiling here. The game weaves together its compelling narrative to comment on the nature of artificiality, the human condition, escapism, and more. It can't be emphasized enough that Nier: Automata is an entirely unique game. It sets itself apart from legions of games in similar genres and styles. Aesthetically, Automata is a mixed bag. The music, is both beautiful and haunting, and the game remixes reuses music in a variety of ways. They add narrative weight to scenes, to add humor, or to simply amplify the atmosphere of an area. Unfortunately, the visuals aren't on par with the sound. The game looks pretty enough. Strong character design helps make the main cast more endearing and interesting, but the environments are drab and dull. Enemy design is often repetitive and less than exciting. Some standout areas like an amusement park showcase the art direction well. However you'll spend a whole lot of time in rather samey crumbling cityscapes. Despite this, the overall package is absolutely worth the price of admission. 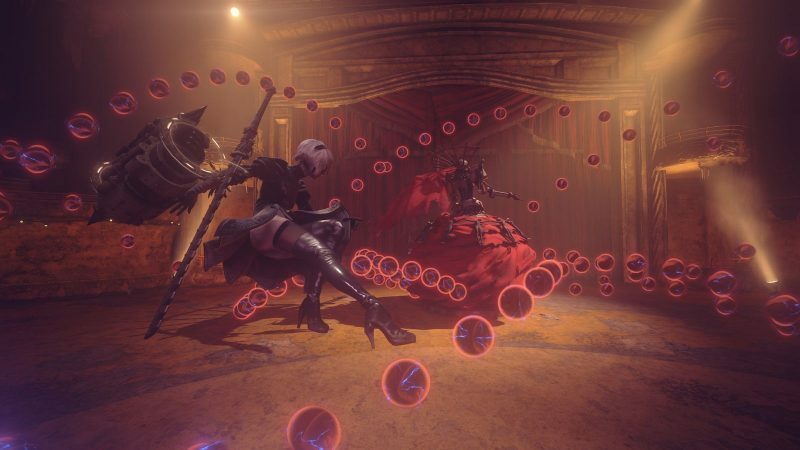 Nier: Automata seamlessly blends genres of gameplay and story to weave a compelling narrative that is at times funny, at times fascinating, and at times tragic. It takes elements that gamers will find all too familiar and repackages them in unique ways. It also constantly excites and surprises. The music is beautiful and the action is fierce. The story is strong enough to pull you through the wide variety of endings the game has on show. I can't even share some of best stuff this game has to offer for fear of spoiling the experience. Nier: Automata is absolutely worth at least a few playthroughs. The expert story direction from Yoko Taro combines with the thrilling and excellent action brought by PlatinumGames to create an incredible experience. For fans of RPGS or action games, Nier: Automata is a must-play. For anyone interested in the way video games can move forward as a medium, Nier: Automata is a must-play. I really can't recommend this game enough.